Here's a basic and quick recipe for a vegetarian oven-baked pasta casserole with just five easy ingredients, plus a little salt and pepper. It's ready for the oven in no time and you can personalize it with whatever you have on hand. The variations are endless. A few suggestions: use a homemade marinara sauce and fresh basil, try a blend of Mozzarella and Parmesan, add breadcrumbs, or, for a moister baked pasta, add in one well-beaten egg. Mix in a package of mixed frozen veggies to make it more nutritious. Enjoy - it's foolproof! Cook pasta according to package instructions, then drain well. Set aside. In a large bowl, combine the ricotta cheese, Italian seasonings, a bit of salt and pepper, and half of the marinara pasta sauce. Add cooked pasta, tossing gently to combine well. 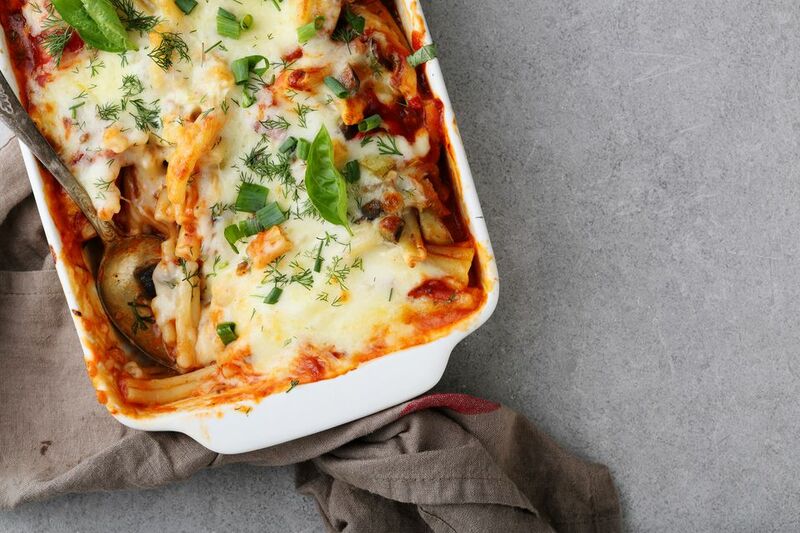 Use half of the remaining marinara sauce to cover the bottom of a casserole dish, then spoon pasta and cheese mixture on top in an even layer. Cover with remaining marinara sauce, then sprinkle the top with mozzarella cheese. Cover with foil and bake for 20 minutes. Remove cover and bake for an additional 10 minutes, until golden brown and hot throughout.